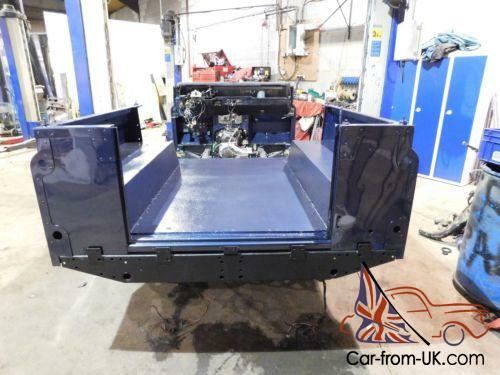 Due to many requests of: "How much is a Basic Specification" Off Chassis Restoration Vehicle?We have completed this ebay Listing to show our Base Price and Base Specification. The Price is £49. 00 Pounds Sterling to answer so many requests and enquiries!In US Dollars that equates to $64. 70 US Dollars! - based on 1. 27 exchange rate and bank fees. Please Note:This Price is Excluding any Clients Optional Extra Equipment. Excluding Shipping from the UK. Agent Fees to Clear Customs and Import Duty. All of these details are highlighted further below. 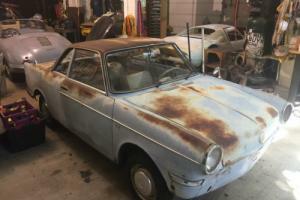 But the Good News is: Yes - Your very own "Bespoke Off Chassis Restoration" from £49. 00 Pounds Sterling Complete. elivered to Southampton Docks UK all within the price - ready for Shipping to the USA. You can pay in Pounds Sterling or US Dollars. 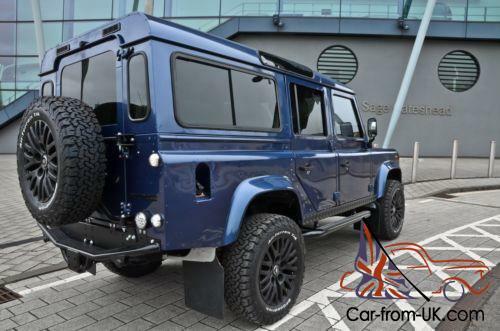 Order Your Very Own "OFF CHASSIS RESTORATION" as this already sold customer Defender. from the USA Export Specialists. This unit delivered to the West Coast - Another Three units in current production which are currently available for you to reserve and purchase. choice of: Gun Metal Grey Metallic. Rioja Red Metallic. Cairns Blue Metallic(same as advertised colour example). r you simply order your very own first Colour Combination to match your personal taste. Delivery Build Lead Time is only 3 Months for a fresh build. "Huge Standard Specification Package Deal" - Price of £49. 00 Pounds SterlingPlease read description as below to appreciate the quality of craftsmanship and prestige bespoke standard of refurbishment. "Paintwork and Body":Fully Refurbished Bulkhead;New B Pillars and Long Side Extension along sills. Bulkhead removed and fully refurbished. New Front Floors. Second Row and where applicable. New Front Wings. New Rear Panels and so much more!Pedal Box all removed and Galvanised prior to re fitting. 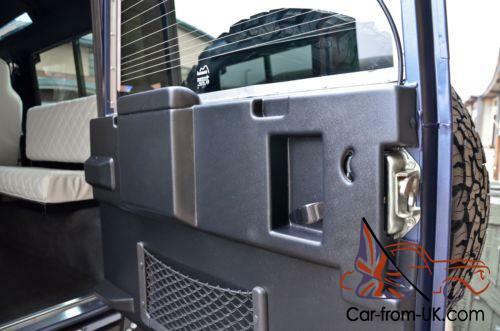 Full Bare Metal Repaint in every sense With: Brand New Defender Doors x 5. Yes Brand New all Powder Coated prior to Painting. New TD5 Hinges throughout. New Stainless Steel Bolt Kits. 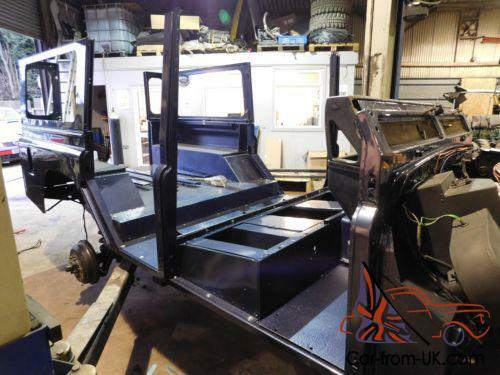 New Door Arms/MirrorsThe Body is Painted off the chassis - then re fitted - together with fully refurbished BulkheadEngine Compartment and Inner Wheel Arches are all Painted within the preparation process. 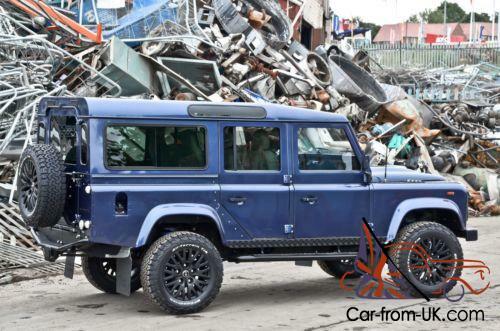 "Mechanics";Engine 200 TDi Fully Refurbished/Re conditioned modern style 200 TDi -- not a 19J 2. 5 Turbo Diesel -With New Timing Belt/Pulley Kit. New Thermostat. New Water Pump and Gasket. New Belts throughout. New Oils and Filters. "Gearbox/Transfer Box/Front Diff";Ashcroft Gearbox LT77 Fully Re conditioned Gearbox with 12 Months Warranty. =======Ashcroft Transfer Box with 12 Months Warranty from them direct -- Best in the World. =======Ashcroft Front Diff with 12 Months Warranty from them direct - Best in the World. 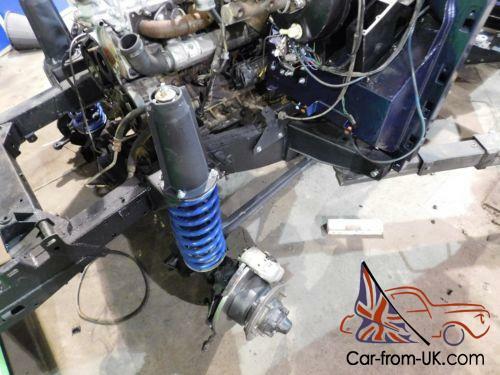 =======New Left Hand Drive Steering Box - OME from Land Rover - not aftermarket. New full Clutch Assembly. Master Cylinder. Slave Cylinder and Hardware. New full Exhaust System. New Radiator and Intercooler smaller Radiator - 200 TDi - New Springs. New Shockers. New Turrets/Cones/Bolts. New Propshafts. New Track Control Arms/Bushes. New Polybush Kits. New Brakes - Pads/Discs/Calipers/Rear Brakes/Brake Pipes fitted to Chassis within Build. Fully Refurbished Axles. New Anti Roll Bar/Bushes. New Tailgate Wash Wipe Motor. New Wiper Motor. New Wiper Arms x 3 and Blades and so so so much more!. even a new Speedometer in miles per hour. 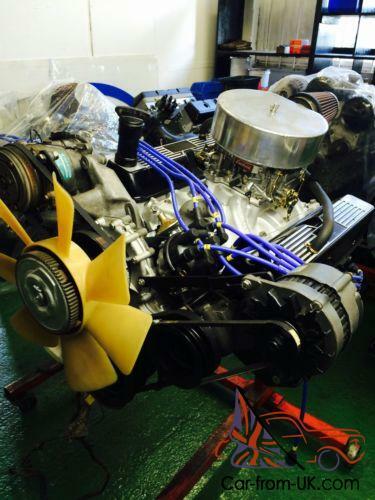 "Engine Choice"============ Our top selling 200 TDi Diesel - Fully Re Conditioned and Re Build in every sense. OR - Our 3. 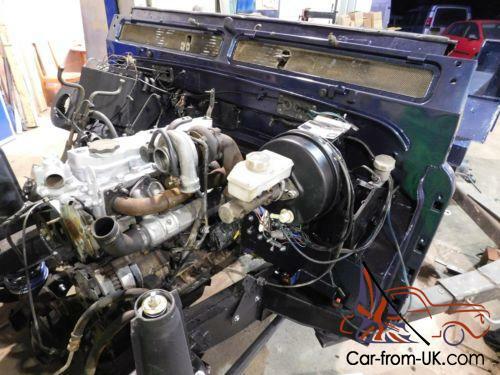 5 V8 Petrol/Gasoline - Fully Re Conditioned and Re Built by RPI Engine V8 Specialist. 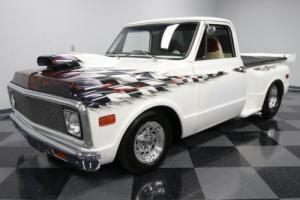 Simply Your Choice for personal taste --- PHOTO Just added of Engine Example as above. 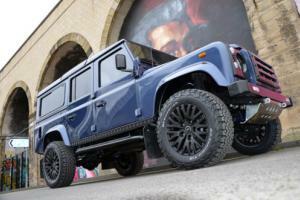 "Standard Huge Specification"In Addition to the above;New Black Carpets to entire Defender. 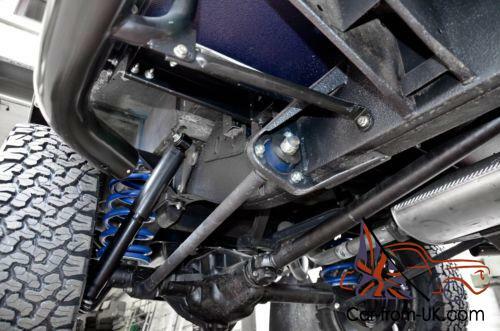 Power Coated Rear Wheel Carrier. 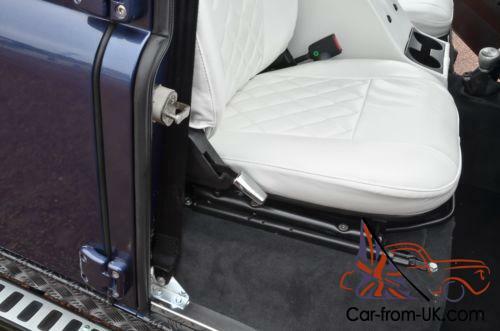 New Seat Belts throughout entire vehicleNew Main Door Seals. New Rubbers to Sills. New Doors. Windows and too much to listNew Front Bumper with TD5 Rubber end caps. New Front Windscreen and main Rubber. New Main Door Seals x 5New Bulkhead Vent Rubbers with Stain less Steel fitting kits. Stainless Steel Bonnet Screw Hinge kits. Tailgate top spec rear for cardLED Lights clear in colour - New Left Hand Drive HeadlightsLED Rear Fog and Reversing LightAll Electrics professional fitted as above with heating system and all instruments working and illuminationBrand New Wheels and Tyres x 5:Deep Dish Modular 16 inch Wheel Rims in Black or Silver with 235 R16 All Terrain Tyres. Paintwork Colour Combo of your choice. including Body. Roof. 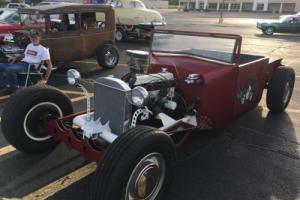 Grill and Wheel Arches. Standard Cloth Seating with New Centre Cubby box. 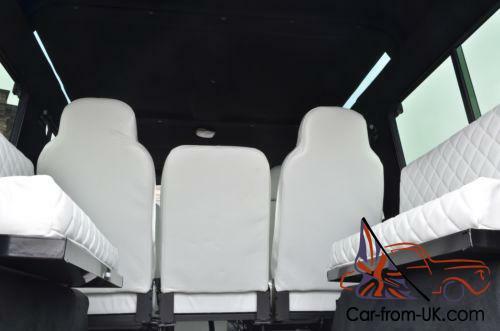 as a nine seater. Two front seats. cubby box and 60/40 split second row seating with far rear twin bench seats. Free Delivery down to Southampton Docks UK - to Shipping Agent. 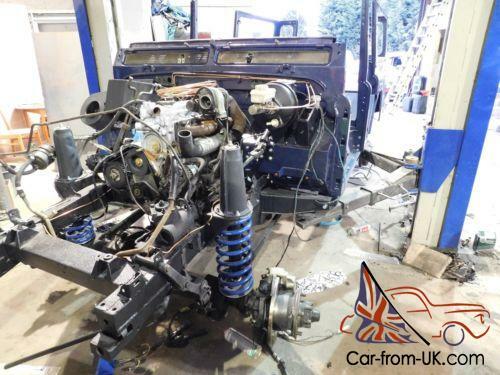 The Above is all Included within our Standard Off Chassis Restoration Build. 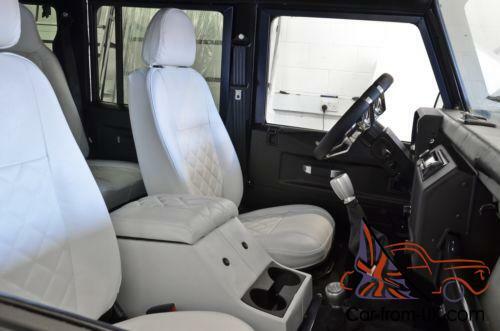 Optional Extra Equipment Available at extra cost:=====================================Black or Light Grey Suede Head liningsSuede to all Plastic Window surrounds and A/B Pillars interior. Suede Sun VisorsLeather Door Cards to main four doors. 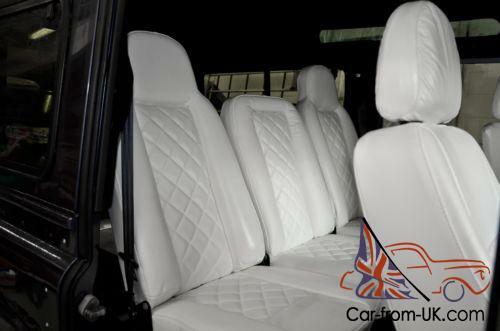 Full Leather Seating -- Top Leather supplied by "Muir of Weir" as also supplied to Bentley Motor Cars as their own site. 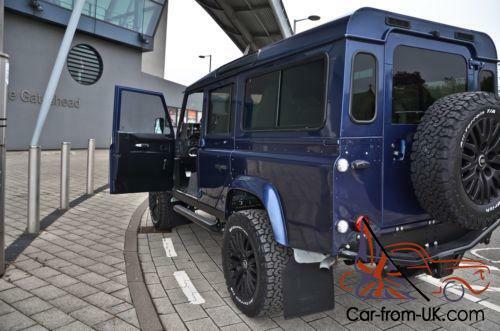 9 Seater Defender. with front Heated Seats. centre Cubby Box with switches. 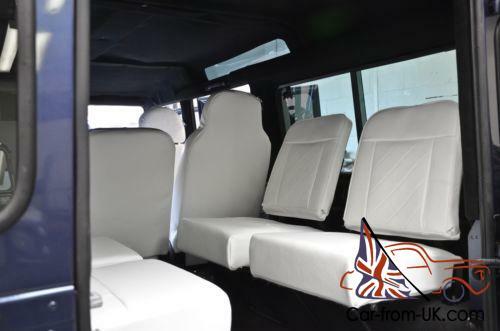 Second Row Leather in 60/40 low back or high back seating as photo's and choice of far rear Leather bench seats or 4 x individual seats as photo'sLeather Top Dashboard in Nero Black Leather. Air Con Front large GrillKBX Top Wing and Side CoversKBX Front Grill and Headlamp CoversTop Wing Checker Plate and Side Sill Checker PlatePuma Metal Bonnet. 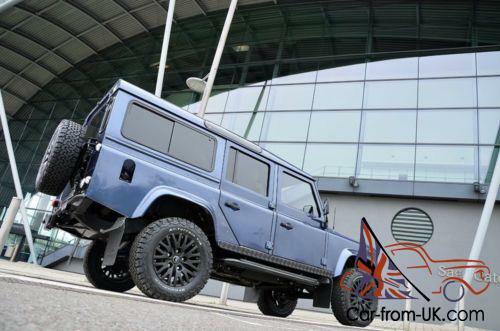 Puma Bonnet HingesNAS Rear Bumper with black rubber toppingFire and Ice top spec Side StepsIndividual Side StepsTomb Raider Side StepsStainless Steel Door Entry Covers. Stainless Vent Covers dashboard. Stainless Heater Controls and Seat Recliner HandlesAluminium front Steering GuardAluminium Package to Gearstick Knobs with Leather Black top spec Gaitors; exmoor trimAluminium "Sunseeker Yacht" Steering Wheel -- from Khan - with matching steering boss to fitKhan 18 inch Limited Edition Defender Wheels - from Khanwith GF Goodrich all terrain Tyre Packge x 5. Aluminium 30 mil Wheel Spacers. Alloy Wheel Nuts. Locking Nuts. Centre Cap. New Black Tinted Glass 15% to front Windows and 60% from Second Row Doors. including Black Tinted New Sliding Side Windows. new Black Tinted Heated Rear Window and far rear Oval Windows. all from Massai Window Specialists. New Music System with iPhone compatibility. Radio/CD. 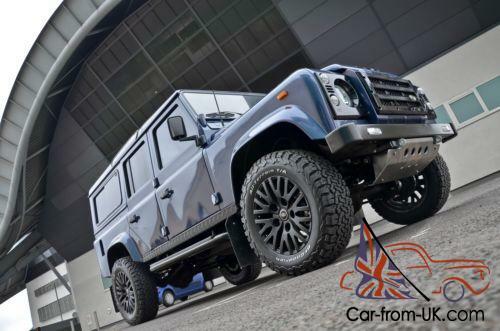 with Centre Dashboard to fitNew Front Bumper with "Day Time Running Lights"Silent Coat Sound Proofing to all floors. 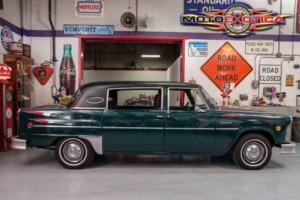 bulkhead roof and all five doors. 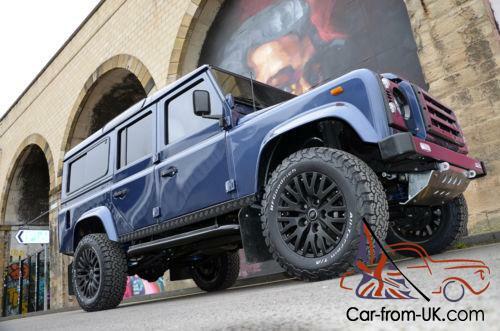 Roof Racks and Ladder also available all Powder Coated Black - G4 Challenge Style Design. Alloy Wheels Options; Khan as highlighted above. 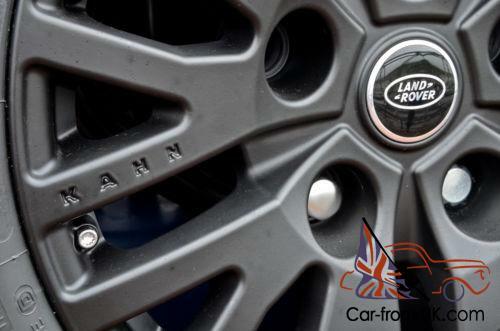 plus options of Saw Black Alloy Wheels or Boost Silver AlloysTyre Options: GF Goodrich All Terrain Tyre Package. "Contact Detail";Please message via ebay system and we will reply by return and will forward you direct easier electronic scenario contact detail. 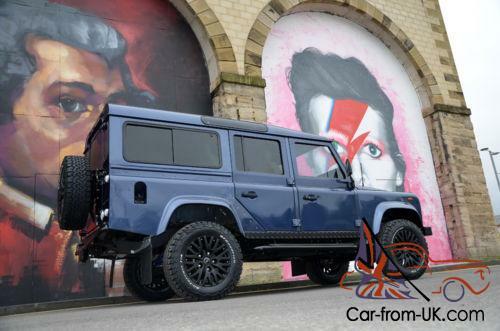 Contact by Telephone:UK Direct Number +44(0)7397 894656Defender Off Chassis Restorationfor any further information. We can call you back due to low local telephone rate costs to the USA. simply request by message or a quick call. Please note we do not deal with any no caller ID enquires or any cold caller sales/calls.